The Indiana Pacers don’t get the Christmas Day games and rarely dominate the highlight shows. They might be the NBA’s best team, anyway. So the Cavaliers have a tough assignment for their final game of 2013. Unfortunately, even the easier assignments haven’t gone so well lately. The Cavs enter Tuesday as losers of five straight and seven of eight. The Pacers have won four in a row. Read: The Cavs aren’t expected to win this game. But one of these days, in order to get their season turned around, they’ll have to win one they’re supposed to lose. And what a way it would be to ring in the New Year, huh? Venue: Bankers Life Fieldhouse, Indianapolis. * All five Pacers starters average double figures in scoring. The Cavs have four guys who average double figures in scoring on the entire team. * The Pacers are 17-3 in the Eastern Conference and 14-1 at home. They have beaten the Cavs in seven straight and 13 of the previous 14. 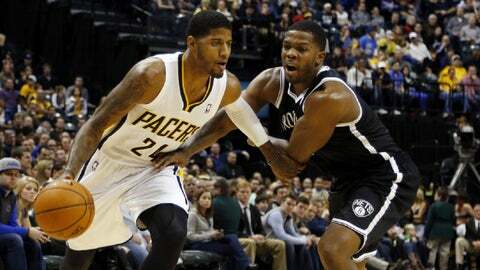 * Pacers F Danny Granger, a one-time All-Star, has returned following year-long knee issues. He’s played four games off the bench, compiling averages of 6.3 points and 3.0 rebounds. * The Cavs have played five overtime games already this season. They’re 3-2 in OT, but have lost the previous two — each coming in their last two home games. One was Sunday vs. Golden State, the other last week (in double OT) vs. the Hawks. The Pacers are 1-0 in overtime. * The Pacers are 22-1 when they lead after three quarters. The loss came against the Miami Heat and the refs. Indiana barely failed. * If the Cavs can lead after three quarters, however, they might have a chance. The Pacers are a pedestrian 2-3 when trailing entering the fourth.